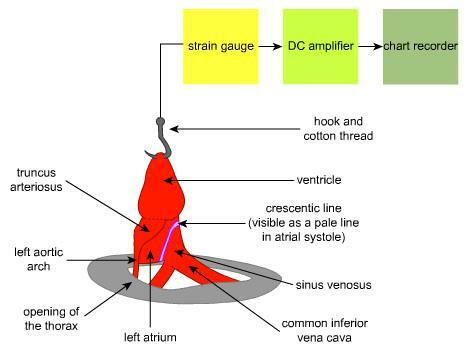 An interactive, menu-driven program which simulates a number of experiments performed on the in situ heart of a pithed frog. 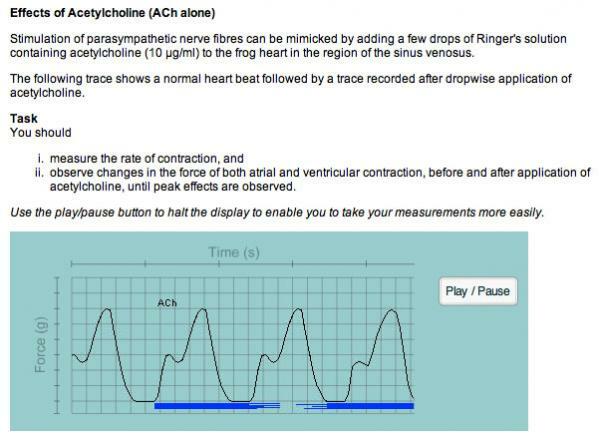 High-resolution simulations of the frog heart contractions, derived from real data, are presented on a scrolling display to simulate a chart recorder. The trace may be paused to facilitate measurement of heart rate or to assess changes in the amplitude of atrial or ventricular contraction. Experiments include: the effects of adrenaline, acetylcholine (with physostigmine or atropine), and temperature, together with an investigation of the refractory period and electrical conduction through the heart (Stannius ligatures). Each experiment is prefaced by introductory text and includes an experiment guide and assignments. Target Audience: Undergraduate students of medicine, dentistry and biological sciences.